Emily Ratajkowski celebrated Thanksgiving yesterday(November 22nd) at the Elle Luxury Party which was held in Madrid, Spain. 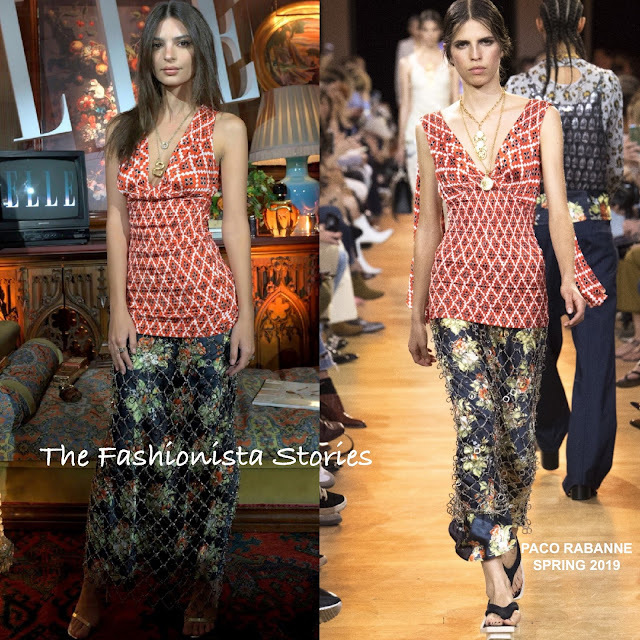 Emily seemed to blend in with the decor, wearing a PACO RABANNE SPRING 2019 ensemble which featured gold necklaces, a red printed crepe de chine top and a navy floral, high-rise satin maxi skirt which was layered with a gold chainmail skirt. Emily's top also featured cape-effect sleeves which she had tied in the back. On the beauty end, she kept things simple with minimal makeup, and center part straight tresses which topped off her look along with gold sandals.